These Chocolate Cupcakes with Peanut Butter Frosting are a deliciously sweet dessert for everyone to enjoy. 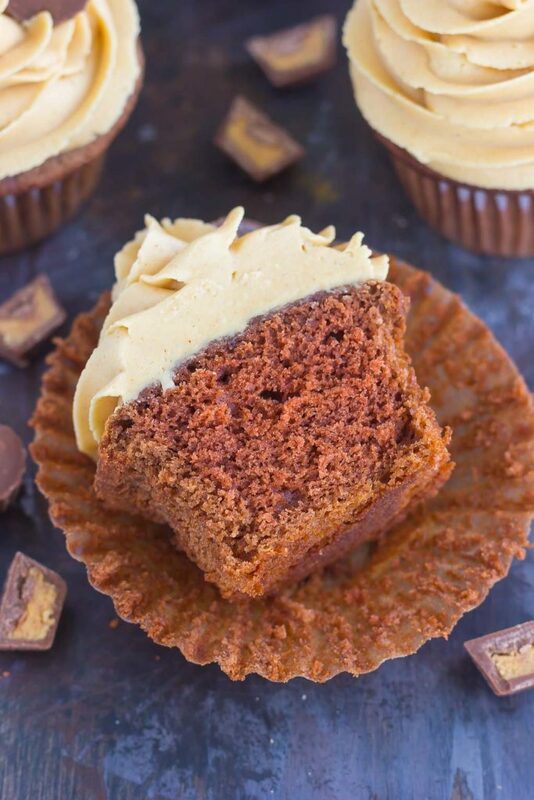 If you’re a fan of chocolate and peanut butter, you’ll love the rich and fluffy cupcakes that are piled high with a creamy and silky frosting! So can I tell you how spoiled my dog is? Without being judged, of course. Since the hubster and I don’t have kids, Callie is spoiled, and I’m not ashamed to admit it! Case in point: when I go to Starbucks, she comes along and gets a ‘puppacino’ which is just a mini cup filled with whipped cream. As soon as we pull into the drive-thru, Callie starts looking at me for her treat, as she knows what’s coming. And ice cream. Callie gets doggy ice cream that I buy from my grocery store and even a popsicle every now and then. Most days, I take her to an off-leash dog trail that’s almost 1.5 miles long, where Callie can run free on the paths, explore the trees, grass, and shrubbery. Even though it’s enclosed, it’s different than a regular dog park because of the paths for people to walk on, and also the size. Since Callie is a high energy lab mix, this helps get her energy out, get her the exercise that she needs ( and me, too! ), and makes her happy. When we don’t head out to the trail, we go on walks, play in our backyard, or go for a treadmill session (yep, I’ve trained my dog to use a human treadmill). Callie and I also recently completed agility lessons, so she’s now a pro at running through hoops, weaving through poles, and riding a teeter-totter! Along with that, she’s got about 50 million toys, bones, and treat puzzles. Every day, she gets at least one bone or chew to munch on, along with various treats, including her favorite kind…peanut butter! I know most dogs love peanut butter, but Callie looooves it. She has her own jar of peanut butter that I use to fill certain toys with and then freeze (it keeps her entertained!) or just for when I want to give her a tiny spoonful. Say the word ‘peanut butter’ and you’ll have an eager follower (and friend!) around the house. Now, if you don’t have a dog, then you’re probably shaking your head in disbelief. But, if you do, or have ever owned one before, then I’m sure you can understand my incredible love for my fur baby. And that leads me to today’s sweet treat: Chocolate Cupcakes with Peanut Butter Frosting! Although Callie can’t have the cupcakes due to the chocolate, she definitely approves of the peanut butter frosting. I know chocolate cupcakes and peanut butter frosting aren’t anything new, but I just had to try them for myself. You may remember after I shared my very first cupcake recipe back in November that I’m still getting used to frosting. Well, practice makes perfect, right? 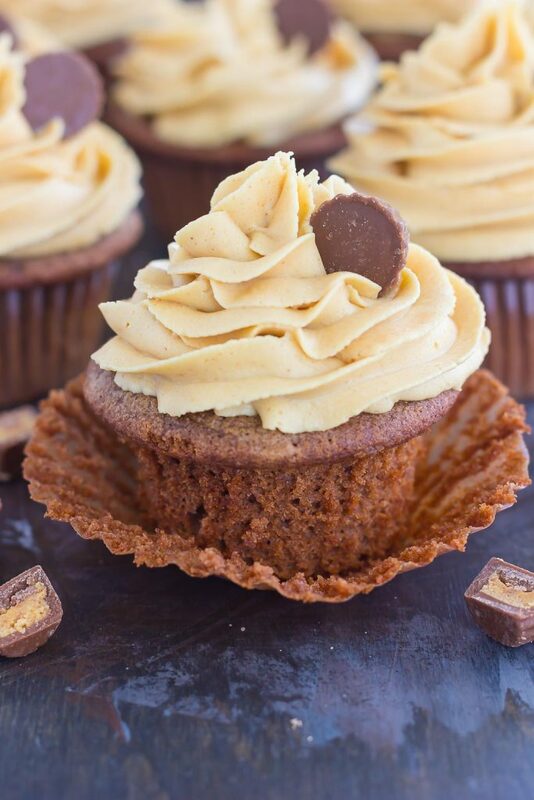 Although I’m nowhere near perfection, I do have to say that these Chocolate Cupcakes with Peanut Butter Frosting are as close to perfect as you can get, based on taste. The chocolate cupcake base is rich, soft, and moist…all of my requirements for a cupcake! And that peanut butter frosting…mmm mmm good! Slightly sweet and filled with rich peanut butter, you’ll want to just dig in with a spoon. And hey, go ahead, I won’t judge! So if you’re in the mood for a classic dessert, need an easy treat to impress those party guests, or just feel like baking in the kitchen, these Chocolate Cupcakes with Peanut Butter Frosting will hit the spot. 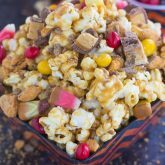 Chocolatey, peanut buttery and oh-so delicious, you’ll be making this classic treat over and over again! 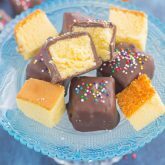 Looking for more chocolate desserts? I’ve got you covered! These Chocolate Cupcakes with Peanut Butter Frosting are a deliciously sweet dessert for everyone to enjoy. 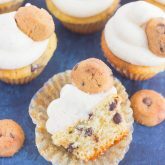 If you're a fan of chocolate and peanut butter, you'll love the rich and fluffy cupcakes that are piled high with a creamy and silky frosting! Preheat oven to 350F. Line 36 muffin tins with paper liners. Set aside. In a small bowl, add the chocolate chips and butter. Microwave on medium power for 1 1/2-2 minutes, or until chocolate chips are melted, stirring halfway through. Once melted, stir thoroughly to remove any lumps. Set aside. In a large bowl, add sugar and melted chocolate. Beat with an electric hand mixer or stand mixer with fitted paddle attachment until combined. Add eggs one at a time, beating well after each addition, followed by vanilla extract. Beat in flour mixture until smooth, alternating with milk. Spoon mixture 2/3 full into each muffin tin. Bake for 20-22 minutes, or until toothpick inserted into center of cupcake comes out clean. To make the frosting, add butter and peanut butter to a large bowl. Cream for 3 minutes until light and fluffy. Add powdered sugar, 1/2 cup at a time, beating well after each addition. Add heavy cream and vanilla extract, stirring to combine. Pipe or spread onto cooled cupcakes and top with a mini peanut butter cup, if desired. So fun that you and Callie are doing agility training! You need to post videos! :) Cupcakes look delicious (as always). This is seriously the BEST flavor combo! Well, your frosting looks pretty darn perfect to me! I'm not the best at piping frosting, but am a pro at eating it, lol :D Chocolate and PB is pretty much one of my top combos so these are made for me. So pinning, of course :) As for spoiling your fur baby, I can totally understand that. Ours has a ton of toys and is given treats every single day. I can't believe you trained Callie to walk on the treadmill! That is so awesome and funny at the same time (love to see a pic of that!) She's a lucky girl! P.S. Our fur baby loves pb too (and also Cheez Whiz, lol). Happy Monday, my friend! Haha eating frosting is way better than knowing how to pipe it, right? :) It took a while to work with her on the treadmill, and is still a work in progress, but fun! Oh and I will have to try cheeze whiz for Callie, I think she'd love it! Thank you for the sweet comment, friend! Ain't no shame in spoiling your fur-baby, Gayle! Boy and I don't have human children either, so our dog is very much treated like our child.. and I make zero apologies for it! ;) How did I not know that Starbucks had puppacinos????!! Ummm I need to get my baby some of those!!! I'm not sure I can bring her to a Starbucks though, as she is totally NOT well behaved. Needless to say she would have failed that agility class. Lol. And umm no way is she going to be patient enough to get on a treadmill. But in her defense, she's a baby wolf (aka a husky) and it's in her DNA to be crazy. lol. Aaaanyways, LOVE these cupcakes!! SO FUN and FABULOUS! I miss peanut butter cups SO much!!!!! There are few things that are chocolate that I just miss to my core, but PB cups are one of them. I'm going to have to make these for the hubster so I can live vicariously through him as he devours a dozen. ;) Pinned of course! Cheers! So glad you understand my dog-spoilingness! You should just get your dog a puppachino then and bring it back to her...she'll love it! I wouldn't take Callie in a store either, but she will sit in the car in the drive-thru. Sounds like your fur baby is so sweet! Too bad our pups can't get together and play. Thanks so for the cupcake love and pin, friend! Oh, I can TOTALLY relate to you. And honestly, I feel sad for people who can't because I think dogs just make our lives so much richer and happier! I feel even sadder for people who have dogs, but can't relate! My dog is SOOOO spoiled, but it makes me soo happy to see her happy. She's all about the puppuccinos. For some reason, she doesn't like peanut butter plain (only in baked goods LOL), but she'd definitely be eyeing me as I made these cupcakes. Which I would absolutely LOVE!! I totally agree! And I'm so glad you can relate, dogs are the best and my life just wouldn't be the same without one! Thanks, Sues! We do have kids and our pup Dolce is still spoiled! Sometimes she gets so much attention we call her 'Mariah' as in Carey...hahahha! She's a little diva and we adore her!! These cupcakes are everything I'm craving right now! Love me a classic!! :) Pinned! Haha I love it! Mariah...makes sense! :) Thanks, Annie! Callie is so cute! This sounds just like my dog, he loves peanut butter and when he hears me open the jar he heat so excited. I wish we had that kind of dog park around here. These cupcakes look beautiful! I definitely need to give them a try! Aren't dogs funny with peanut butter? :) Thanks for the sweet comment, friend! I'm a firm believer that dogs should be spoiled. They give us unconditional love and are always there for us. I've always had a dog and can't imagine not having one! Callie is lucky to have you. :) That said, I love chocolate and peanut butter too and these cupcakes look like a downright perfect way to start a Monday! I totally agree! The unconditional love that dogs give is just the best. Thanks, Marcie! Callie deserves all the love and yummy treats! We loved spoiling our family dogs too when we were growing up. They were crazy about peanut butter too. And these pretty cupcakes are so perfect for Monday! It is so fun to spoil dogs! :) Thanks for the cupcake love, friend! Thanks for the cupcake love, Karly! chocolate + peanut butter = the BEST combo ever! and this peanut-butter-frosting!!!!! OH MY GAWD, love this! hahah um yeah you're not alone - Emma is essentially treated like a human at our house! :) And she LOVES peanut butter too!! I'm with her - peanut butter is just the best! These cupcakes sound fantastic!! Dogs sure do love their peanut butter! :) Thanks, Ashley! 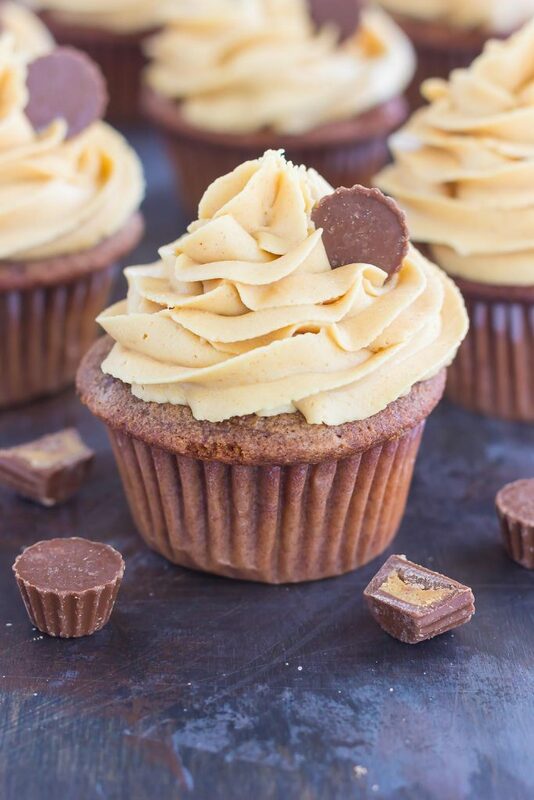 I love chocolate and peanut butter,these cupcakes look so yummy! We don't have kids either, so our cat is our fur-baby! I totally get how easy it is to spoil them. It's great that you have a place to take Callie to get her energy out! 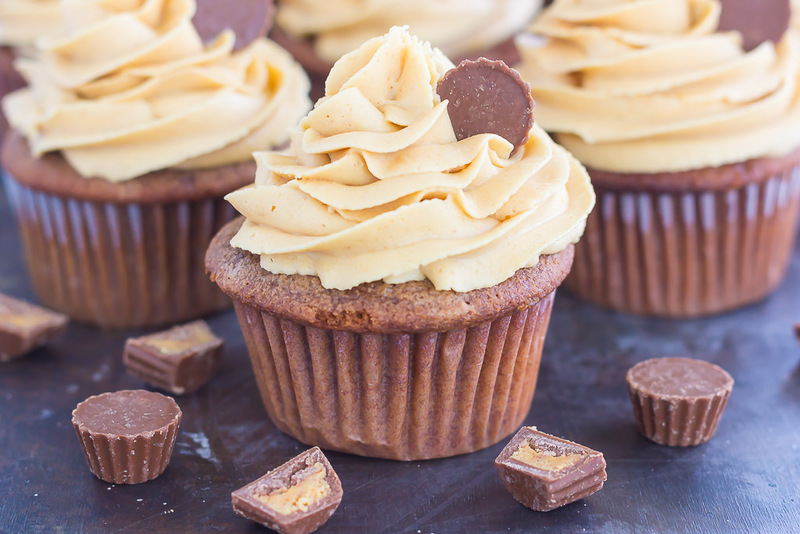 These cupcakes look amazing - peanut butter and chocolate is a favorite of mine. 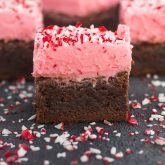 And, your frosting looks perfect - like a pro! Yay for fur babies! :) Thanks for the cupcake love, friend!